t’s spring and your chapter is full steam ahead with events and meetings to make your networking and learning potential greater and more fulfilling. First and foremost, I wanted to thank all of our volunteers and contributors who work so hard in bringing our programs to our members! From those who serve on the Chapter Board of Directors and our Committees as well as to our sponsors who provide the means for us to grow and be successful. I can’t say thank you enough to all of you who have spent so much time and energy serving our membership and this amazing chapter. As President, its been truly a pleasure watching everyone come together to bring us meaningful education and networking while making all of this fun and full of energy! I can speak first hand that by becoming active in the chapter, it has paid off for me in building friendships and by far, making my position as a community manager for a large scale community a lot easier. I am humbled by those who preceded me to make the chapter better each and every year. Please find time to commit to CAI Central Florida and know that while it may require a little elbow grease, you will get so much more out of your participation. I promise that! A special shout out in print to everyone who worked so hard in making this year’s CA Day such a huge event! WOW! If you did not attend, you missed one amazing opportunity. Check out some of the pictures from the event on page 20. This was by far one of, if not the best, trade show and educational events to date! We had well over 100 booths, and one of the biggest crowds of attendees I have seen. Even our Volunteer Homeowner members were in attendance in large numbers. To all the folks who participated in the educational sessions, thank you as well! In making the rounds myself, I heard nothing but great feedback from all across our membership. A job well done to all! And would you believe we don’t stop there. The 2019 Board of Directors is committed to bringing all of us effective education and programming that we can all benefit from. On April 12th, the Board will be participating in a Strategic Planning Session with the assistance of CAI National to work on some of our challenges and build on our successes. This will be a first for us and if I may, another learning opportunity for all those who participate. Off the heels of all this planning and discussion, we roll right into the National Conference being held right here in Orlando. From May 15th-18th, at Rosen Shingle Creek. Feel free to check out the event and all of the educational classes that are available by going to www.caionline.org. To top off this large event, the best part is the Chapter Party! That’s right, we have some plans for you! Come to Connect, Learn and Explore on May 16th at CAIddyshack from 6:30pm-10pm at Drive Shack off of the 417. We’ll have entertainment by the Marcus Gullen Band. Registration can be done online and these events are a huge hit as each city that hosts the National Conference tries hard to beat out the last party host. I know we have done it this year! a message from the CED Thank You Volunteers! excellent tournament this year. The Communications Committee is doing some fun things; look for us on Facebook - @CAICentralFlorida! The Board of Directors are wonderful and I treasure them all. Thank you so much for all you do. There are so many volunteers, that I cannot name you all in this note, but know that you have my undying gratitude and love. I could not do this without you! You are all valued and loved! Branch Banking and Trust Company is a Member FDIC and an Equal Housing Lender. Loans are subject to credit approval. Only deposit products are FDIC insured. ÂŠ 2016, Branch Banking and Trust Company. All rights reserved. 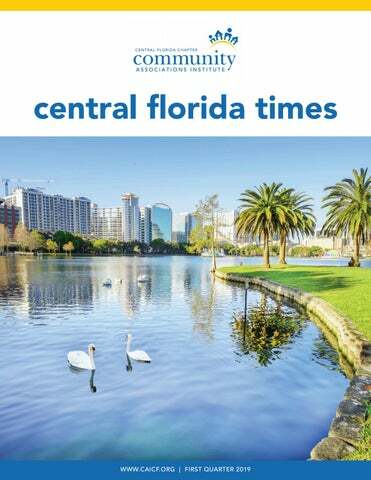 central florida chapter update 2019 calendar of events More details regarding upcoming events will be posted to caicf.org under the “Events” tab. Check back regularly for the most up-to-date information. CAICF Board Meetings will be held before or after each of the Monthly Meetings. Please be sure to register for all events in advance, as we need an accurate head count for space and food purposes prior to the event. Thank you for your help! •	April 13th: Sunshine Foundation Dream Village Volunteer Work Day at 8:30am. RSVP today at caicf.org. •	April 25th: Spring Happy Hour from 4pm-7pm at Gator’s Dockside (45 W Crystal Lake St., Orlando, FL 32806). Free event; just meeting up with our CAI friends! •	April TBD: New Member Breakfast •	May 2nd: Monthly Meeting: Luncheon - Understanding D&O Insurance presented by AssuredPartners at Dubsdread. Registration begins at 11:30am. Register today at caicf.org. •	May 15th-18th: CAI Annual Conference at the Rosen Shingle Creek in Orlando. The conference provides education sessions on operations, leadership, innovative business practices and new products and techno​logies. Industry professionals and homeowner volunteer leaders from around the world come together to discuss critical issues, network and learn about the latest community association trends.​Learn more at caionline.org. •	May 16th: CAIddyshack National Chapter Party at the Drive Shack in Orlando from 6:30pm-10pm. Entertainment by the Marcus Gullen Band. Tickets are $100 and include two drink tickets. Register today at caicf.org. •	June 6th: Monthly Meeting: Luncheon - Service Animals CEU presented by Dara Lahav, from Garfinkel Whynot Association Law at Dubsdread. Registration at 11:30am. Castle Group is the premier choice for Community Management, specializing in serving the finest Condominium and Homeowner Associations. hile most lawsuits that a community association is a party to settle before trial, there are plenty of times when you, as a board member or manager, may be required to testify. The thought of it doesn’t raise your blood pressure or make you decide to schedule a long vacation IF you take some time to understand your role and consider how you can be most effective. A trial is nothing more than a formalized communication platform. The parties, through witnesses (managers, board members, others) and their attorney, tell a story to the audience (a judge or a jury). It is the telling of the story that is important in having a successful day in court. Attorneys act as a guide to help witnesses tell the story. NEW! Pay with electronic check! Renew online today. Itâ&#x20AC;&#x2122;s easy, convenient, and fast! Pay your renewal dues and update your community association board member information in one, quick transaction. Simple, secure, reliableâ&#x20AC;Ś complete your renewal today! 10. The Effective Story Teller makes his/her delivery vital and keeps it free from distracting elements – don’t let personality conflicts with the other party or attorney color your story and your presentation. Remember as you are preparing for your testimony that the jury doesn’t know anything and the judge and attorneys don’t know as much as you would like. You are in the best position to educate them and tell the association’s story – one of the keys to a win! offers a DBPR approved seminar on this topic and would be happy to present it to your team over breakfast or lunch. Feel free to contact Joe at jsmith@burgsimpson.com or Annika Mantius at amantius@burgsimpson.com or 941-777-6776.
a better board member? We’ve got you covered! Robert Riddick, the Foundation’s PresidentElect, is a volunteer board member in his community and has relied on Foundation Best Practice Reports to navigate the good, bad, and ugly situations that have developed over the years in his own association, all while improving the quality of his neighborhood. Or earn your PCAM? Former Educator of the Year Paul Grucza, also a Foundation board member, shares that Best Practice Reports are an important component of CAI’s education curriculum. and generate new business with one small donation! Donate to the Foundation’s Big Picture campaign with a gift as little as $40 and your peers, colleagues, and clients will know that you make decisions based on factual data that has already been tested, vetted, and approved! Made in Florida, For Florida... Period. The association board of director’s authority is set forth in the articles of incorporation. Original by-laws can be amended to reflect the changing needs of the association. The procedures for amending the by-laws require a unanimous vote of the association membership. State law requires that board members read the by-laws prior to taking office. By-laws take precedence over state law. The procedures set forth in the By-laws are only advisory and need not be followed. Actions of a Board can be invalidated if the board was not properly elected or formed. A Not For Profit community association is not held to the same standard of a For Profit board of directors. The board of directors’ cannot be sued if it chooses not to enforce the rules set forth in the CC&Rs. The board of director’s is only responsible for claims asserting monetary damages. The board does not need to read the CC&Rs or the By-laws. That is what a management company does. The CC&Rs take precedence over state law. The CC&Rs need to be updated periodically to comply with new changes in the law. The board is not responsible for conduct of the management company and or its employees. The CC&Rs do not apply to board members if he or she has not read the CC&Rs and By-laws. The board of directors are required to adhere to all rules promulgated by the hired property managers. The advice of an attorney creates immunity from liability for the board. The board cannot be sued if the community association fires or harasses an association employee. All D&O policies provide coverage for the failure of the board to obtain or maintain insurance and the only issue is to purchase the least expensive policy, because all policies provide the same coverage. All D&O policies provide coverage for breach of contract claims by a third parties/business partners. The Board of directors, the association, or association volunteers cannot be sued for defamation, because they have volunteer immunity. The board of directors has no exposure if there is a data breach of association information, even if the association information was the result of the management company being breached. A board or its association is only liable for damages up to the amount of its insurance limits. Any duly elected board member can make unilateral decisions throughout the association as they deem necessary. Banking solutions to help your communities thrive At Union Bank®, we offer customized banking and lending solutions to meet the unique needs of the community association industry. With over 25 years of experience, our specialized HOA team applies their in-depth knowledge to help support and grow your business. Learn how we simplify banking and the financing of your projects at HOAbankservices.com. Financing subject to credit and collateral approval. Other restrictions may apply. Terms and conditions subject to change. ommunity associations are creatures of budget. The primary purpose of a budget is to provide certainty and avoid surprises as the board complies with its obligation to protect, preserve and enhance the association assets. the insurance proposal is proper coverage to protect, preserve and enhance the association assets. More often than not, board members primarily focus on “price” when purchasing insurance. However, “price” is only relevant if the options presented substantially provide the same coverage apples for apples; or there are never any claims. More often than not, the management agreement with the Association requires that the association unilaterally indemnify the Management Company and the CAM for claims arising out of services provided. Caveat: Remember not all insurance is created equal! The board is obligated to protect, preserve and enhance the association assets. Primarily focusing on price in the insurance decision process is counterintuitive to this duty. Where in the governing documents does it provide that the board has a duty to save the association money when purchasing insurance? Nowhere! Rather, the duty is to determine what insurance will best protect the association assets. insurance cont. CAUTION: CAMS BEWARE! Many management agreements expressly provide that the CAMs assume the task of purchasing and maintaining the association’s insurance program. In other situations, many management companies take on this role voluntarily and may involve preferred insurance business partners in the process. This practice in and of itself is not necessarily a problem. However, there are a number of traps for the unwary, including who is ultimately responsible for any errors in the purchase and maintenance of insurance. The key individuals that should be most concerned here are management company “owner” and Boards. 1. INDEMNIFICATION Most management agreements have an indemnity provision that provides that if the CAM is sued for something it did for or on behalf of the association, the insured needs to provide the CAM defense and indemnity. Accordingly, the managed association must be able to fund that obligation. Many CAMs and Boards “assume” that this can be funded by the association’s Directors and Officers policy where the CAM is almost certain to be added as an additional insured, or are included in the policy definition of insured. As a result, the funding of the obligation owed the CAM is by the associations assets, special assessments or a loan. always seek counsel from a community association professional? Boards are always looking for cheaper anything. Why not obtain counsel from a community association insurance professional who does not charge. The “cost of insurance” is not the same as the “point of sale premium.” The “cost of insurance” is the total amount the association incurs at the time of a loss or claim plus the value of peace of mind that the association receives during the claims process. If the board made sure they purchased the best coverage for the association, the cost of insurance will have been a good deal. However, if the focus was the point of sale price as opposed to coverage, there is a very possible reality that the cost of insurance could be significantly higher than the price, because the association will be self-insured for the coverage that was sacrificed for the cheaper price. Caveat: More important for associations than “point of sale insurance premiums” is not being surprised by uncovered claims! It is also important that the Management Company or CAM understand the indemnity provisions of your state. Not all states will allow indemnification for someone’s active negligence, and many if they do allow indemnity for active negligence, that provision must be expressly set forth in the agreement, and in some states follow a certain formula. 2. COMMUNITY ASSOCIATION D&O POLICY Most Boards, Management Companies and CAMs “assume” that since the management company was working on behalf of the association, and since it is an additional insured on the D&O policy, that the CAM will be covered and that is how the insurance claim against the CAM, for whom the association agreed to provide defense and indemnity will be funded. Unfortunately, virtually every D&O policy on the market “excludes” coverage for claims by the association against the Management Company or CAM. Even worse is that there are some D&O policies where the Management company or CAM is not even covered under a policy. 3. MANAGEMENT COMPANY/CAM PROFESSIONAL LIABILITY INSURANCE Virtually all CAM Professional Liability Insurance “expressly excludes” any claims arising out of insurance claims. This should make sense, because a professional liability policy is intended to cover the professional from its industry professional services. CAMs are not licensed Insurance professionals. 4. CONFLICT OF INTEREST Some management companies or CAMs have their own preferred insurance professional who in turn has its own preferred insurance carrier. There are also some where the insurance is a division, affiliate or subsidiary of a management company. These may in fact provide the best products to protect the association’s assets. However, there are two key requirements. First, any such relationships must be expressly disclosed to the association board. Second, under this scenario, the management company or CAM must still conduct its due diligence as to the best available coverage, and not just the best price. 5. BUSINESS GOOD WILL There are “Good Will” issues that can arise from insurance issues. First, very often the management agreement has a unilateral indemnity agreement flowing from the association to the Management Company or CAM. Theoretically, if the CAM does not purchase and maintain the appropriate coverage, it is still protected, because the association must defend and indemnity the management company or CAM. Who will tell the board that we the management company are being sued, but you have to defend us. As long as the management company is not concerned about losing the client, there is no problem. Does the management company and CAM have an obligation to disclose this to the association before the agreement is entered? they are additional insureds on the association insurance policies, but they do not make sure the association’s policy is not the best. The management company and the CAM’s coverage is only as good as the associations. TAKE AWAYS •	Community Association Insurance Professionals do not charge to meet, counsel or present to your Board. Make the Insurance Professional’s E&O on the line, not the Management Company or CAM. The Insurance Professional, not the CAM is the licensed insurance expert. •	Boards should exploit community association insurance professionals for two reasons. First, boards owe a fiduciary duty to the Association and relying on a licensed community association insurance professional. By doing so, the board develops a strong defense to a strong business judgment defense. Second, the counsel is free. •	Always make the board review the application, make any changes they need and have the appropriate board member sign the application. •	Not all insurance coverage is equal. Joel W. Meskin, Esq. is the Managing Director of Community Association Products for McGowan Program Administrators. For more information, contact Joel at jmeskin@mcgowanins.com or 440-333-6300, ext. 2240, or visit mcgowanprograms.com. Second, what will the neighbor associations or other associations think when they hear about this? What will the impact be on the association property values? All the resources of a large management firm with the focus and customer service of a family owned business. Ms. Jazmine Rojas Leland Management, Inc.
Mr. Eddie Vargas, Jr. Leland Management, Inc.
May L Morales Towers Property Management, Inc.
Managers Council and Homeowner Leaders Council. The Membership Representation Groups recognize the unique characteristics and needs of each of the CAI member classes, give them a stronger voice in crafting policy and provide a vehicle for making recommendations on CAI services and benefits. Find more information about CAI leadership at www.caionline.org/ leadership. One of our very own Central Florida Chapter members was named to the Community Association Instituteâ&#x20AC;&#x2122;s Business Partners Council for 2019! Please help us congratulate Jennifer Agravat of Asphalt Restoration Technology! n lieu of a special assessment for the project, a loan can defray the cost over time and it will impact the reserve the least. Eventually, an HOA board must brace itself for major construction, reconstruction or infrastructure projects. It’s taken for granted by boards that they will eventually be required to install new sewers, remove trees or completely replace roofing all projects that take a big chunk out of an annual budget. With a single family home, the homeowner may need a loan to underwrite the costs of a project; the same alternative can work for an HOA. Because the cost of major projects is shared by the homeowners, a special assessment could cover the cost, but if major reconstruction is required for a large development, financial assistance could be a more favorable alternative. If a board decides against a special assessment for the project, a loan can defray the cost over time and it will impact the reserve the least. cash for a large project, the need may supersede the cost. A reserve study helps to ascertain the financial health of the HOA, includes a financial analysis of the HOA, and explores financial alternatives in funding future projects. A reserve study will also include a needs assessment that will detail which projects should be addressed as the community ages. 2. Hire a Construction Manager to Perform a Site Review A construction manager is not the same as the contractor. He is the “middleman” who keeps the Contractor(s) on schedule and reports back to the HOA Board and property manager. Construction managers are vital to maintaining communication between the various parties and helps to make sure the involved parties are paid during the course of progress payments. He will make sure that all the substantive details of each segment of the project are performed as required. navigating large hoa maintenance projects cont. just the sewer lines themselves. It could require city permits, reserved parking (if the development does not have enough existing parking for contractor vehicles), tree removal services, concrete, and landscaping services. The construction manager, in tandem with the HOA board, performs the site review - the construction manager, because of his expertise, and the board, because of its knowledge of the property. 4. Write Project Specification After the site review, the construction manager will compile the project specifications. These not only include the building aspects of the project but ancillary items such as storing equipment and materials, proper disposal, permits, sanitation, safety, timelines, payment schedules, warranty of work, certificates of insurance, and copies of contractors’ licenses. At this point, the construction manager should supply a report to the HOA board with recommendations for contractors and an overall estimate of the cost based on prior similar projects. 5. Request Bids After the construction manager has compiled his specifications and provided the HOA board with his report, the board may wish to preliminarily vote for the construction manager to move forward with requests bids for the project or the various project segments, if applicable. This may take some time as the construction manager, property manager and/or board president may obtain several bids and testimonials for each contractor. During this time, if a loan is the best financial alternative, it is time for the HOA’s accountant to try and remove as many negatives as possible from its balance sheet (fines, late fees, or foreclosures). The cleaner the HOAs books are, the more likely the association is to obtain a loan at a favorable rate. Once bids are gathered and contractors voted upon at a board meeting (which may take up to 2 months to complete), it’s time for the next step. payment schedule. If weather impacts progress and therefore progress payments, frequent communication among all parties is a must. SCHEDULE AND COMPLETION Depending on the type of project, a start date must be chosen. Obviously, in rainy climates, it’s unwise to start a roofing project during the rainiest month of the year. Generally speaking, regardless of the location, spring is the start of drier weather (more specifically, from May through October). Unless it’s a smaller community, this should be a rule of thumb, even for sewer projects where water runoff can affect worker access. A schedule of approximately 4 to 6 months can cover both the preliminaries (from hiring a construction manager to signing contracts) and the job itself. If the job involves extensive reconstruction of a larger community, it may mean a schedule spanning more than one calendar year. During the project preparation, it behooves the HOA board to keep residents advised of any obstructions, noise, blockages, as well as of progress and expectations. It’s also important to keep in touch with contractors to ensure the job is being performed on schedule and without incident. Keeping all parties in the loop will make the job run smoothly and lessen the likelihood of delays. Once completed, the board and construction manager must perform a walk-through to make sure all work is done to specification. Staying on top of maintenance helps the HOA avert emergencies and plan for necessary projects. Creating a plan for large projects is critical for the long-term well-being of the community to not only maintain the quality of living but property values as well. only and does not necessarily represent the thoughts, views or opinions of Sperlonga Data & Analytics and should not be construed as legal advice. For more articles like this one, please visit www.sperlongadata.com/blog. Easy Does It To use. Pretty much everything. Our advanced reserve studies help you achieve a deeper engagement with your properties and a more effective way to manage them. Both today and tomorrow. And with total confidence. Our remarkably simple reserve study system. For your reserve study proposal, contact Nick Brenneman at (800) 980-9881 or visit reserveadvisors.com. bioengineered living shorelines cont. logs comprised of coconut fibers. Installed in areas with direct water flow, these biodegradable logs can help redirect water movement while reducing erosion along delicate banks. Coconut “coir” logs are biodegradable, compact and excellent solutions for properties in need of a truly custom erosion control approach. Whether you decide to move forward with a complete shoreline restoration or are several years away, it’s imperative to properly budget and integrate proactive management strategies that protect your banks and hillsides, while preserving the water quality of your aquatic resource. Cultivating a beneficial vegetative buffer with flowering native vegetation will help stabilize soil during rainstorms. Deep-rooted flowering plants can also help pull excess nutrients from stormwater runoff, preventing the growth of nuisance weeds and algae in the water resource. Undesirable nutrients can be further combated with the professional application of naturally-occurring nutrient remediation products, which permanently “lock up” and prevent nutrients from fueling aquatic weeds or algae. embankment erosion and create a natural foundation for vegetation. The most effective systems available are designed using a combination of ecofriendly, biodegradable burlap sock-like fabric and heavy-duty knitted mesh. The socks can be filled with local pond muck and sediment, which is why many property managers choose to pair this solution with proactive hydro-raking projects. After the woven mesh systems are filled, they are then secured to the embankment and can be immediately sodded, planted with native beneficial buffer plants, or seeded through the mesh and fabric layers. Just like lawncare, lake and stormwater pond management is an ongoing commitment that requires different approaches throughout the year. While no two waterbodies are the same, each and every aquatic ecosystem is susceptible to shoreline erosion and can benefit from custom management plans that integrate buffer management and nutrient remediation, as well as other sustainable tools like hydro-raking, aeration, biological augmentation, and regular water quality testing. Whether your waterbody is in its prime or has seen better days, contact your lake management professional to restore and prolong your water resources—starting with the shoreline. SOLitude Lake Management, an industry-leading environmental firm. He has nearly two decades of experience leading high-profile shoreline stabilization and wetland restoration projects. This article is the second in a series featuring new break-through technologies that will revolutionize the management of lakes, stormwater ponds, wetlands and fisheries in 2019. Learn more at www. solitudelakemanagement.com/knowledge. A TRUSTED PARTNER FOR COMMUNITY ASSOCIATIONS Sherwin-Williams understands the needs of HOAs and has the products and services to ensure long-lasting curb appeal and easy maintenance. From premium paints that provide performance and protection to color design services, on-site assistance, maintenance manuals and more â&#x20AC;&#x201D; weâ&#x20AC;&#x2122;re here to help throughout the state of Florida. BUT fishing for a way to fix issues in your asphalt, stucco, windows and roofs is NOT! Let Burg Simpson help prevent you from going on a fishing expedition by providing a TAR. ® © 2016 Valley National Bank®. Member FDIC. Equal Opportunity Lender. All Rights Reserved. Are you looking for a Law Firm specializing in Community Association Law and related matters? Contract reviews, document amendments, legal opinions, and support for your every-day community association needs. Eﬃciently handling a large volume of collection cases with our proven withheld billing format. Cost-eﬀectively litigating your legal proceedings for bankruptcies, construction defects, evictions, mortgage foreclosures, and more. Flat rate covenant violation enforcement process, including initial demands, mediation and litigation. got credentials? If you have credentials, you have credibility. More than just letters after your name, CAI credentials identify you as the right professional for the job. They give employers confidence that you have the knowledge, experience and integrity to provide the best possible service to their associations. CAI provides opportunities for industry professionals to fast-track their companies and careers and stand out from the competition. If you hold a CAI credential, you are automatically listed in CAI’s online Directory of Credentialed Professionals, where potential employers and clients can find you—and see that you stand above the rest. Learn how to earn CAI credentials today . . . visit www.caionline.org/credentials or call (888) 224-4321 (M-F, 9–6:30 ET) for more information. 1 Stop Pool Pros Alliance Association Bank Angius & Terry, LLP AriasBosinger Asphalt 365 Asphalt Restoration Technology Systems AssuredPartners Atlantic Southern Paving Ball Janik, LLP BB&T Association Services Becker BrightView Landscapes Castle Group Cepra Landscape Driveway Maintenance EmpireWorks Reconstruction and Painting Enviro Tree Services Florida Paints Gerstle, Rosen & Goldberg, PA Glickstein, Laval, Carris, P.A. DHN Attorneys, P. A. Martell & Ozim, P.A. Tannenbaum Scro P.L.